Wrasses come in kinds of colours. 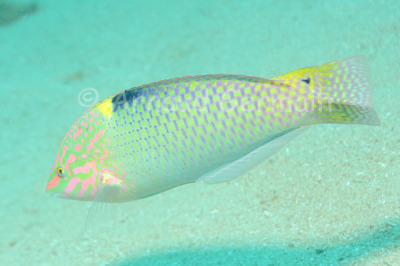 This checkerboard wrasse is quite a common fish on sandy bottoms. It is really colourful but swims quite fast. I have seen this fish next to a stingray which was digging for something to eat. The wrasse was darting in and out of the sand cloud that the stingray was raising, getting bits of food thanks to the effort of the ray. Nikon D700, Nikon 28-105 mm macro at 75mm, F8, 1/250th, ISO 400, Ikelite Housing and Ikelite DS160 strobe set on TTL +1.3EV. Shark Bay, about 15 metres down, Sharm El Sheikh, Egypt.